I have been wanting to make macaroni and cheese for a few weeks now. My schedule hasn’t really allowed for cooking anything that takes beyond…oh…15 minutes. On my pseudo-vacation this week, I had the luxury of eating something that required real cooking. The basic recipe I use is one that was printed in the New York Times earlier this year for "crusty macaroni and cheese". It’s a great base for tweaking the recipe to add all sorts of ingredients. For this version, I buttered the dish with a Parmesan butter that I now keep in stock from Savor. I substituted Dreamfield’s elbow pasta for regular pasta – fewer carbs and you cannot tell the difference in the texture. I changed up the cheeses used to be more white cheese based. I used the hunk of Raschera cheese that was on hand. Delicious! I also had a few stray leeks in the fridge, so they got thinly sliced and thrown in the cheese mixture before I added the pasta. The top is dotted with more of the Parmesan butter to get that golden brown color. 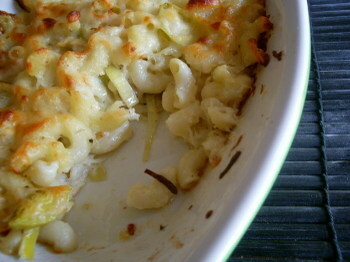 – In a large bowl, toss together the pasta, cheeses, leeks, cayenne, and salt & pepper to taste. Place in prepared pan and evenly pour the milk on top. Sprinkle reserved cheese evenly across the top and dot with remaining butter. Bake uncovered for 45 minutes. Raise heat to 400 and bake for another 15 to 20 minutes until crusty on top and bottom. 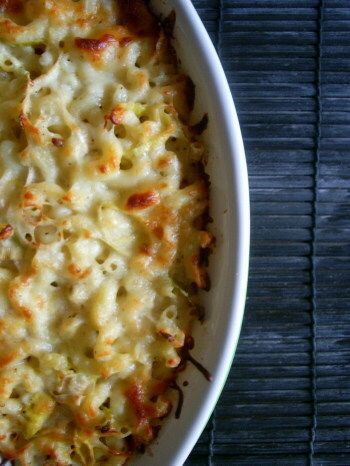 oh my… mac and cheese all grown up! Sounds delicious!